Why Did Thousands of California Fish Suddenly Turn Up Dead? 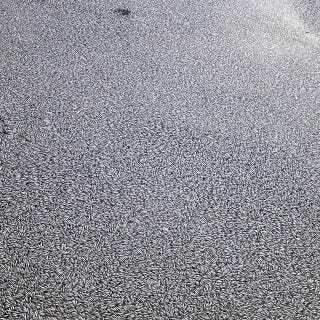 This photo might look like a bit of abstract art, but it's actually a shot of thousands of fish - anchovies and sardines - that turned up dead en masse in Marina del Rey, near Los Angeles. What could explain the sudden death? Researchers are still investigating, but the most plausible explanation is a sudden, localized decreased in oxygen in the water. Amy Freitag, a fellow at the California Ocean Science Trust and blogger at Southern Fried Science, says that the especially warm weather that California has been experiencing may have led to the series of algae blooms that have been occurring off the coast. "These are especially common in protected harbors, as harbors also collect nutrient run-off from land. The algae dies, bacteria go to town on their little bodies, and then bam, hypoxia." Essentially, the fish suffocated. Heal the Bay, on the other hand, has said that there wasn't an especially high amount of algae in the water. "Samples will be analyzed for the presence of any harmful algae, though early reports indicate there is no discoloration of the water to indicate massive amounts of algae." In addition to the thousands of bait fish, the die-off also included some rays and sharks, and likely others as well. Volunteers are working with Heal the Bay and other organizations to clear the dead, decaying fish from the water's surface, before the stink becomes any more overwhelming. The local California gulls, pelicans, and sea lions, at least, enjoyed the event. They gorged themselves on more food than they could eat, as captured in this video by Kirstin Willingham.